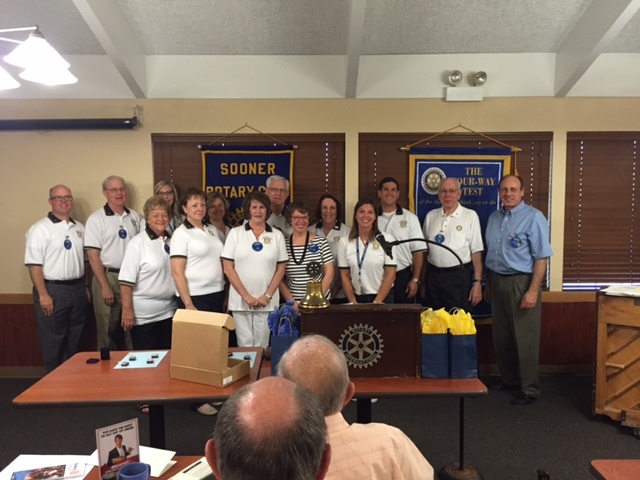 Tuesday morning was a great meeting as former President, Kevin Murphree, addressed the Sooner Rotary Club and expressed his deep appreciation for all of his friends of the Sooner Rotary Club. 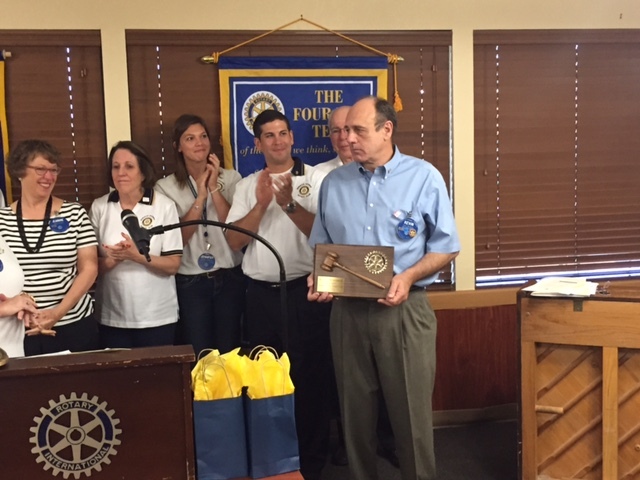 Kevin lead the the 2014-2015 club and board with heart and passion, and appreciated the opportunity to serve as the Sooner Rotary Club President. Kevin shared some of the major projects and fundraisers that the club contributed to over the year with an impressive list. 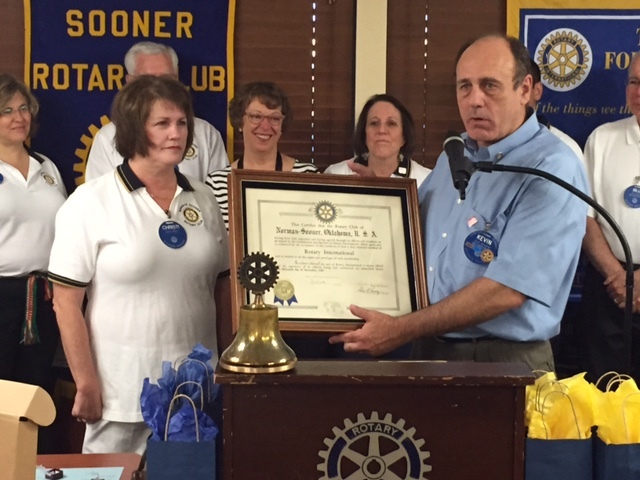 He emphasized the importance of our club and the impact that the members have on this community. He also recognized the outgoing board of 2014-2015 and thanked them for their service. 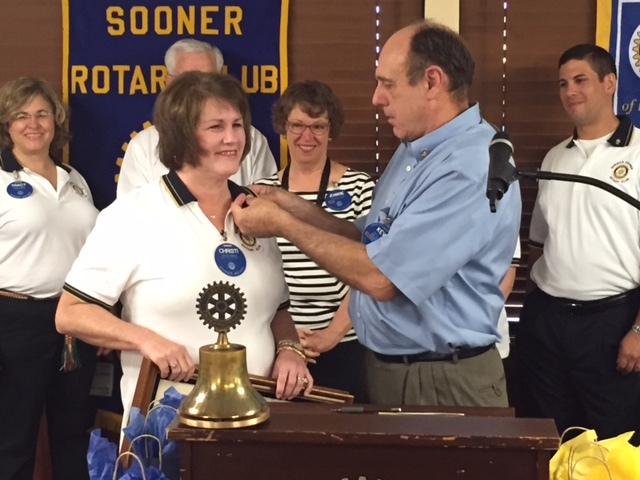 Glenda Thomas had the privilege of introducing and swearing in the 2015-2016 Sooner Rotary President, Christi Moore. 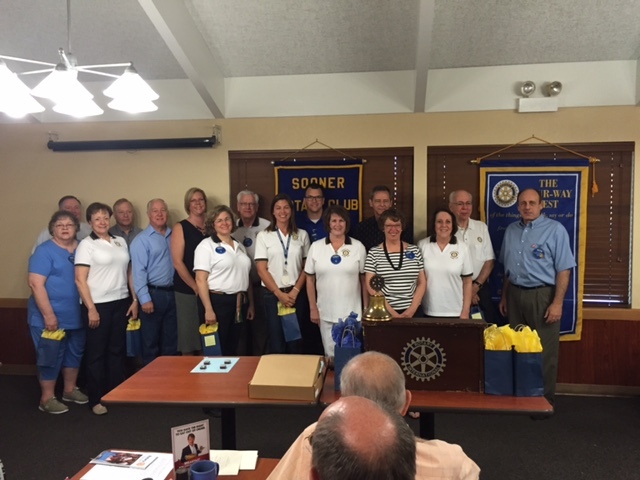 Christi proudly exclaimed that she was honored to serve as the 2015-2016 President and that she looks forward to continuing the success of our club. Christi was pinned as the incoming President and given the Charter by Kevin. Christi recognized the incoming Board Members and exclaimed her excitement for the enthusiasm the 2015-2016 Board Members have for the year. She also presented Kevin with a plaque and pinned him with the presidents pin. Please be sure and join us, next Tuesday, July 7, 2015 at 7:00 am to hear John Woods provide the club with an update on Norman Forward.